The Little Mermaid is on Blu-Ray! My favorite Disney Princess movie has made it’s way on Blu-Ray this month and I was fortunate enough to receive a copy for my birthday! A review would be all too redundant since it was released before I was born and has been loved by viewers ever since. However, to celebrate this occasion I’ll redirect you to a discussion on the beloved film by Paul Boyne and myself on our joint blog “Gaffer Macguffin’s Movie House”. Recently, Paul watched every single Disney Animation film made, which gave us the chance to talk about a couple of them. 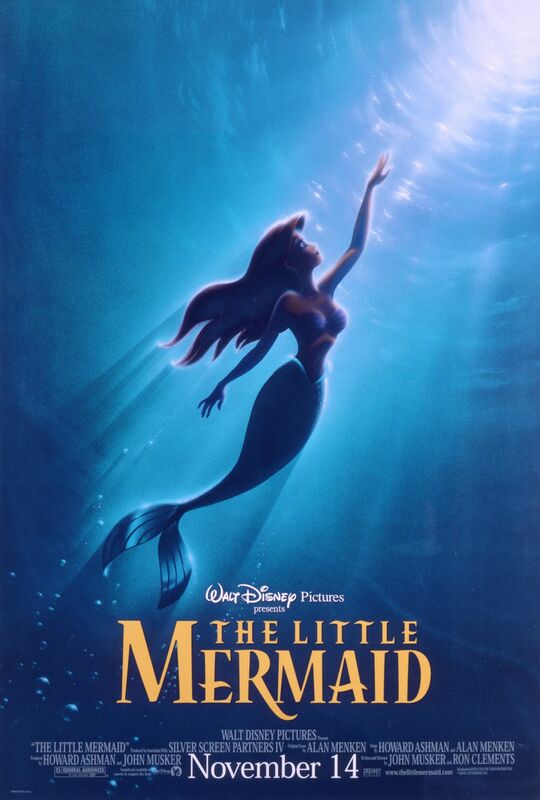 The Little Mermaid played a pivotal roll in bringing about what is known as the Disney Renaissance. Head to the discussion here! Disney has had a long history of creating imaginative retellings of classic fairytales in a way that no other production company has managed to pull off. Often times these stories that are well known are taken and tweaked, adding musical elements and a level of detail rarely afforded to otherwise small stories. The Disney Princess line of products and films is one of the most lucrative business models on the planet, because of this the company is always eager to expand that universe. While, arguably, the messages behind the stories are dangerously optimistic, few can deny that when they’re on their game, Disney Animation studios manages to give the world entertaining stories of extreme optimism with fantastic attention to detail. Tangled was released in 2010, expanding the Princess universe to include a computer animated counterpart in Rapunzel. The film managed to capture most of what makes the classic animated films so great, namely beautiful animation, quirky humor, and catchy musical numbers. Tangled retells the story of Rapunzel, the princess who is locked in a tower for, what she assumes is her own protection. Her most noticeable attribute is, of course, her incredibly long hair. What she doesn’t know is that the woman she believes to be her mother is actually her captor. She was kidnapped at birth for her hair’s magical ability to rejuvenate the elderly and wounded. When the dashing thief, Flynn Rider, enters her life, they embark on an adventure together filled with one liner quips and bouncing musical numbers. As things progress, the villainous “mother” attempts to reclaim her prisoner, while Rapunzel begins to remember her true family. Computer animated films are filling a void left by traditional animation. This higher saturation of CGI, has created an expected amount of mediocre films, which is exactly what I expected Tangled to be. These cartoons are huge money makers for the studios that produce them. What I loathe about Pixar, happens to be their single largest cash cow, and that is the Cars franchise. What I was unaware with this particular project, was the amount of money it cost to produce. 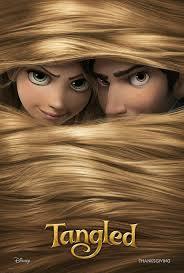 To date, Tangled is the second most expensive film ever made, costing an incredible 260 Million dollars. While that kind of money is never a guarantee for quality, it appears that it was put to good use. Hyperbole is a dangerous, but completely necessary, tool of the filmmakers trade. Thankfully, few wield the tool better than the Coen brothers when it comes to their craft. The pair have consistently create fascinatingly odd movies with unparalleled quality in both storytelling and pitch-perfect casting. What they tend to strive in is a rare type of subtle exaggeration of what makes traditional film-making so effective. This is demonstrated exceptionally well in The Hudsucker Proxy a comedy that affectionately pays homage to the fast talking romantic comedies of the 40s and 50s in which fast talking newspaper men and women did whatever it took to get a story and every day Joe Schmo’s could get a shot at running big companies. The early days of narrative talkies is long gone, but in 1994 the Coen brothers teamed up with Sam Raimi and wrote a story that uses the past as a template for humor and originality. Slight exaggeration of the past is placed tenderly into a full color screwball comedy created decades after this type of film was thought to be long gone. Tim Robbins plays the eager and bright eyed business school graduate named Norville Barnes. Barnes acquires a job in the mail room of the enormous “Hudsucker Industries” a nondescript mega corporation whose owner commits suicide within the first minutes of the film. Sidney Mussberger (Paul Newman) convinces the board to put a nobody in charge of the company in order to make the stocks plummet so they can then buy up the majority of the shares and make the company successful again. Barnes happens to be in the right place at the right time and is handed the company on a silver platter. In the meantime, the newspapers are chomping at the bit to get the scoop on this new sap. Amy Archer (Jennifer Jason Leigh) is the star, Pulitzer winning reporter who takes it upon herself to get in close with the new boss and find out just whats going on. The board is thrown for a loop when Norville’s ideas bring in profit, which is the last thing they want to happen. 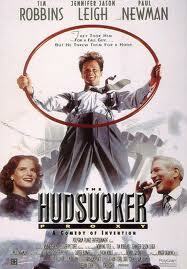 The Hudsucker Proxy is the closest thing to a modern day Frank Capra film we’ve seen in decades. The legendary director of such films as It Happened One Night, Mr. Smith Goes To Washington and It’s a Wonderful Life often used fast talking characters, witty dialogue and a feel good story to draw in an audience. Taking a page out of Capra’s book, the Coen brothers deliver a modern rendition of something that Capra could have written himself. The film is beautifully crafted with sprinklings of bygone gimmicks, including but not limited to: Angels, narrators who control the story, screwball comedy, busy newsrooms and countless other elements that we’ve seen in films from the past. The entire movie is a lovingly made piece of history to honor the type of movie that everyone knows and loves, while giving us a new story, a new plot to cheer for with the same type of characters we’ve seen in black and white for generations. The score matches the emotions of the characters perfectly and the sets are incredible and larger than life. The movie uses incredibly witty dialogue and jokes to fuel the progression of the comedy, but never shies away from the physical pratfall gag when it’s necessary. I literally had no idea what to expect when I put this movie into my DVD player. It wasn’t until I watched the end credits that I even realized that either Coen brother or Sam Raimi had anything to do with it; a privilege of ignorance that I experience less frequently than I used to. When the movie started I immediately felt like I was being greeted by an old classic, the likes of which I had never seen in such stark colors or with these particular actors. For the duration of the film I simply enjoyed the progression of a kind and warm plot told by a gentle narrator; familiar but entirely new. It was a feat that very few could have accomplished, but one that was, in this instance, done very near perfectly. Movies are pre-packaged, condensed adventures for the masses. Life, at times, can seem dull and monotonous, but on the big screen heroes come to life and go on adventures we could only dream of fulfilling in our own lives. We watch romances blossom, witness the discovery of hidden treasure, observe wars being fought and honor upheld. While all that unfolds before us on screen, we sit in a dark room, attempting to forget our own world and the numbing effects it often has on our senses. It’s frightening how the absorption of media without conscious discernment becomes the prevalent hobby of the public at large. Movies are an escape from reality, something that you can get lost in and sink in to. How often do we wish what was happening on screen would happen to us? Woody Allen’s 1985 film The Purple Rose of Cairo knows full well how the typical audience feels about the pastime of escapist entertainment, and he turns the tables. What if the characters staring back at us through the screen long for real life. It’s a classic “Grass is always greener” type of tale that approaches its subject with creativity, humor and a sobering dose of reality. Taking place in the midst of the great depression, The Purple Rose of Cairo centers on the life of Cecilia (Mia Farrow) a woman who’s struggling to support her deadbeat husband by working at a local diner. She spends any free time she can down at the movie theater; she is a cinephile of the highest order. She knows all the actors and all the movies, she goes there to get away from the depression to get away from her life. In doing so night after night, something strange happens. One of the characters in the film, not one of the actors or one of the crew, but a character straight off the screen notices her and acknowledges her, admiring her dedication to the film. He’s interested and simply must meet her. In a split-second decision, Gil Shepherd (Jeff Daniels), one of the minor characters in the film (arguably minor) jumps off the screen and begins a whirlwind relationship with Cecilia. This upsets just about everyone. The characters stuck in the movie can’t progress without Gill and spend their time anxiously waiting for the character to return to the screen. Likewise, those involved with creating the movie are disturbed, particularly the man that portrayed Gill Shepherd in the film, who now has a double running around doing who-knows-what? 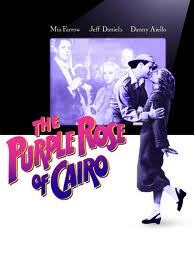 The Purple Rose of Cairo manages to swap places with the audience. Instead of simply watching a movie about two people whose paths cross, we watch a woman watching a movie wishing her life were like the ones portrayed on the screen. We ARE Cecilia; she represents everything that a motion picture audience is. She day dreams and longs for what she sees on the screen, the difference between her and us is that she gets what she wishes for, even though she soon learns at what price she will pay. 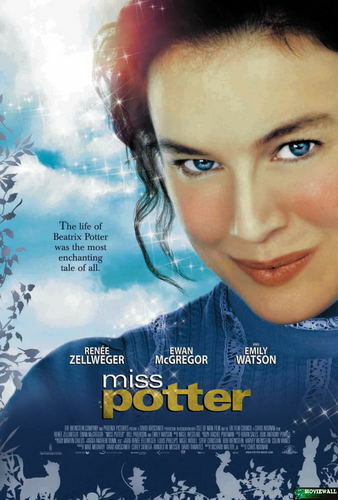 The story is masterfully told with an incredible cast. It’s witty and funny while simultaneously sobering and, at times, downright sad. To watch the characters on a black and white screen interact with an audience that we ourselves are observing is surreal and hilarious in it’s achievement to mock us. These actors stuck up on a projection screen aren’t making fun of a fictional audience, they’re making fun of the real audience that’s sitting in their living rooms watching The Purple Rose of Cairo, which ironically enough is the same title that the film in which Gil Shepherd waltzes off the screen. It begs the question: what if we got our wish to be apart of an exciting movie premise? would it be as fulfilling as we would hope? The Purple Rose is a whimsical piece of film fiction that draws the audience into it’s premise by relating with them on every level; essentially WE are the protagonist. It’s an absolute joy to watch. The social commentary is spot on. Woody Allen manages to create a movie that projects it’s exuberant nature onto the audience without compromising the integrity of the film. Despite the fantasy nature of the movie, we realize that we can relate with Cecillia on far more levels than we may have originally anticipated. Let’s Talk About The Princess Bride, Shall We? I feel like this post may cover some obvious ground for a lot of my readers, but after learning that my wife has never seen the original Star Wars trilogy all the way through, I feel like I can’t leave anything up to chance any more. As most of you know, back in the 1980s a little movie called The Princess Bride was released. It was written by one of the most talented writers to ever pen a screen play; William Goldman. The movie will always remain one of my absolute favorite films, regardless of it’s superficial flaws. What I fear is that the movie has reached the level that many before it’s time have reached. It’s one of those films that everyone can quote and acknowledge how great it is, despite a massive decrease in the amount of people that have actually watched it. For example; I knew quotes from The Godfather years before I actually watched the movie. FilmDrunk actually reported the results of a survey of the top 10 films that people lied about watching. The Princess Bride has been elevated to a legendary status in pop culture. One need merely don a faux Spanish accent and quote the unforgettable line of vengeance uttered by Inigo Montoya in order to gain a grin of familiarity from a total stranger. The impact that the story of Westley and Buttercup has had on our culture is vast. Virtual badges can be seen throughout internet social sites, T-shirts with quotations from the movie are sold in novelty stores, and a devout following has been attracted to the high spirited adventure tale. 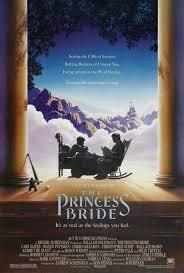 Released in 1987, The Princess Bride was, on the surface, nothing new. The 1980s was notable for a good number of Fantasy flicks, such as The Never Ending Story, Labyrinth, and Ridley Scott’s Legend. Despite all these films displaying far more stunning visual effects for the time, William Goldman’s story about True love and High adventure remains the most notable. Taking the helm to direct the film was Rob Reiner, who helped bring the beloved book by William Goldman to the big screen, and into the hearts of generations to come. It wasn’t a grand spectacle, visually speaking, but what it was, was one of the best written Fantasy stories ever put to screen. Goldman tells a story that everyone loves. True love conquers all. Never backing away from the fact that love is never easy, he tugs at the heartstrings of all his viewers. The enduring characters that Goldman creates let us know exactly what side we want to win. The viewer is led on a journey of emotions ranging from agony, to joy, hate, to love, all the while keeping a light tone without compromising the drama at all. The recognition that The Princess Bride received after it’s release continues to grow. Both critics and audiences continue to love it. In a 2000 edition of it’s magazine, “Total Film” magazine named The Princess Bride the 38th greatest comedy film of all time. In A similar report in 2006, “The Writers Guild of America” selected the screenplay as number 84 of all time. But the reason for the enduring tale is not in the critical recognition, it rests in the fans. The devout following continues to grow. Goldman was no stranger to the writing game when he penned The Princess Bride, at this time he was well known for many screen plays and novels, the most notable being Butch Cassidy and the Sundance Kid, however none come so close to the hearts of it’s viewers as The Princess Bride, which became, and remains a high standard to measure up against in the film industry. Seriously, I know this is true in most cases, but the book is actually better than the movie simply because Goldman isn’t limited by an hour and a half run time. We’re given hilarious and heart wrenching views into the pasts of every character and he writes with a sharp wit that could never be fully translated to the screen. True Love conquers all…Even if it takes a while. This is not only the claim of the film, but it is a view that is expected from a movie by most of the population. How this holds up to actual beliefs is hard to tell, but the idea of love being the strongest bond on earth is not a new idea. The claim is warranted through society and pop culture, this is what people want to believe, as is evident in movies, music and television. Goldman used a fairly simplistic and common idea, and elaborated around it. We see Goldman’s genius shine through by mixing fantasy, classic love story structure, and comedy all the while eloquently giving millions of viewers a simple, recognized idea in a complex and thoroughly enjoyable, relatable, and entertaining shell that is The Princess Bride. If you happen to be in the Bellingham WA area on August 24th 2013 you can watch the The Princess Bride outdoors on a big screen with hundreds of other fans thanks to the Fairhaven Outdoor Cinema, a series of events that happen throughout the summer. There is a fantastic lineup of films this summer, and The Princess Bride is just one of them. Alfred Hitchcock’s reign as the master of suspense is, to this day, uncontested. He is an icon to an industry comprised of icons. The films he created became a standard for which very few have been able to meet, in particular, Psycho stands out as his most gruesome and shocking picture; and it almost wasn’t made. No one was excited about the prospect of funding a film based on the events surrounding the infamous killer Ed Gein. So, he funded it himself. 2012s Hitchcock is the story of the iconic director and his crusade to make the film that no one wanted to watch. The progression of events leading up to the release of Psycho blossoms on screen with suspense, laughter and excellent production value. 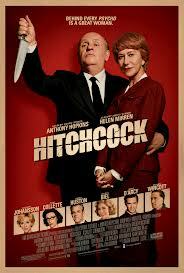 Anthony Hopkins plays the titular director along with Helen Mirren who plays his long-suffering wife, Alma Reville. The movie starts just after the release of North by Northwest and Hitchcock is looking for a book on which to base his next picture. Once he settles on the book Psycho he sets himself up for storms of opposition. After convincing his wife that making Psycho is the right move, he begins the production process. There are numerous obstacles both with the production and his personal life that act as the driving force behind the drama of the film. In particular, Hitchcock’s relationship with his wife is what really makes the film compelling. Alma is constantly putting up with her husband’s vises, namely his wandering eyes, alcohol problem and excessive eating. This drives her to spend more time with her author friend, Whitfield Cook. The film is foremost a love story between Alfred and Alma, albeit a broken love story. The two are incomplete without the other, and are both very broken people. Psycho acts as an allegory for their relationship, without both actively working on it, it is destined to fail, but when they work together it is a piece of true art. The sets and costumes in the movie take the viewer back to 1959 in every way. The studio sound stages along with all the props, act as a visual time machine, impressive in it’s attention to detail. The costumes are fantastic in an all encompassing picture of the past, vibrant and conservative. It isn’t showy in it’s nature, but you can’t help but gawk at the authenticity of the film. There is a certain romanticism surrounding mid 20th century period pieces when they are done well; and Hitchcock, true to the director’s nature, sets the standard. What the film manages to do is give fascinating incite into the creation of the most famous horror movie in history, while giving an excellent dramatic love story with compelling, convicting actors. The film is a testament to the power of love and the difficulties encompassed inside a love story with two broken individuals. The scares are effective, the laughs entertain us, but at the core of Hitchcock is a heartfelt, painful, beautiful love story between two people that were absolutely meant to be together, and meant to display horrific murders on screen to millions of people. I’ve been writing this little blog for 1 year as of yesterday (4/21). I love to write about movies and I’m excited to keep writing in the coming year. I’m thankful to all of my friends and family that have encouraged me to keep writing, and everyone that takes the time to read my little reviews. So, since I’m celebrating 1 whole year, I’ve decided to give away the best movie of all time (at least according the the latest Sight & Sound list) to one lucky winner. That is to say: I’m giving away Alfred Hitchcock’s Vertigo on DVD. here are the rules in order to be eligible. 1. “Like” Popcorn and Peril on Facebook if you haven’t already done so. 2. Share this post (or any of my previous posts) on Facebook and let me know that you have done so. That’s it! I’ll announce the winner on Monday, April 29, 2013. The prize can only be shipped within the US. Good luck and thanks for reading!